I find myself all too comfortable with where I usually find them. They stand upon plaster feet and look down at the congregation through stained glass eyes. They are close enough for comfort, but removed enough to be conveniently forgotten. Any closeness that is offered can come packaged in safe narrative and statuary. Like wild animals behind zoo walls, I can gaze at them without being threatened. The lives of the saints, much like the Life they imitate, can seem to fit nicely in church. For an hour on Sunday I look up to them, marvel at their faith. I hear of their stories. And then I leave with a bulletin in hand with a saint’s name atop it, followed by a parish mission statement that says something about building a dynamic community in response to the Gospel. I tell myself that I know all about the saints. St. Francis loved nature. St. Thomas was an intellectual and a man of significant size. St. Peter was a rock (when he wasn’t abandoning his Lord) and Mary (always garbed in blue) the height of piety. St. Therese gives people roses. St. Anselm created his “ontological argument” (the bane of all college students in “Introduction to Philosophy”). Joseph was the carpenter step-dad to Jesus, John baptized and ate locust and honey. Paul wrote letters. St. Ignatius founded the Jesuits and created a spiritual tradition. We name our cities, churches, and hospitals after them. Even many of our schools. I went to St. Ignatius High School, and I have t-shirts with his name on them. I can tell myself that I love the lives of the saints. I have books devoting whole pages to explaining their faith, hope, and love in too-miraculous-to-be-quite-true-but-I-like-them-anyway stories. Complete with youthful missteps set aside as examples of sinful lives from which they turned, mistakes from back before they “became holy.” Ask me all about patron saints: St. Andrew is the patron of Scotland; St. Jude of lost causes; St. Matthew of accountants; St. Lucy of vision. Francis stands in our backyard, holding a birdbath, thank you very much. They promise protection and guidance and they ask very little. A novena here, some gratitude there. They do not demand worship. They do not pass around a collection basket. “Oh, I know all about the saints,” I repeat to myself. 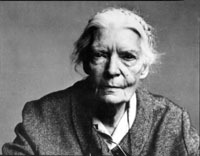 It is no wonder that when called a “saint,” Dorothy Day responded, “Don’t dismiss me like that.” Easy familiarity abdicates the power to shock and scandalize or to attract and transform. This kind of closeness offers little more than undemanding comfort and compliant confirmation of the life I already lead. Day never wanted to so comfort me. She reaches out of her writings—writings so close to her heart—wearing an old sweater, smelling of soup and street, with the challenge, “You only love God as much as you love the person you love the least.” I’m often glad that my church doesn’t have a statue of her. I don’t think I could look it in the eyes. But what if I did? What happens if I allow the sanitizing mask to fall away from the lives of the saints? What if I allow the strange excesses of holiness intimately into my own life? What happens if I allow St. Francis to put down the birdbath and walk with me, challenging me to see each and every part of creation as actually made by the loving hand of God? And believe St. Teresa of Avila when she says to me, “God has no hands but yours”? Or consider what kind of spiritual freedom allowed St. Aloysius Gonzaga to care for the sick in plague-stricken Rome? For to be canonized—to be proclaimed a saint—is to be established by the church as a mark against which we might measure ourselves and take stock of our own faith, hope, and love. And I find that I don’t measure up. Certainly, I don’t “measure up” in that in comparison to them, I live a life significantly less conformed to that of the Nazarene. But I don’t “measure up” in that I don’t even place myself besides them. That is, I don’t measure. For their statues stand at the heights of the church, their faces look down through stained glass eyes. I cannot stand beside them to measure myself. And it’s far easier for me to leave after church—and, anyway, I’m fearful of those kind of heights. 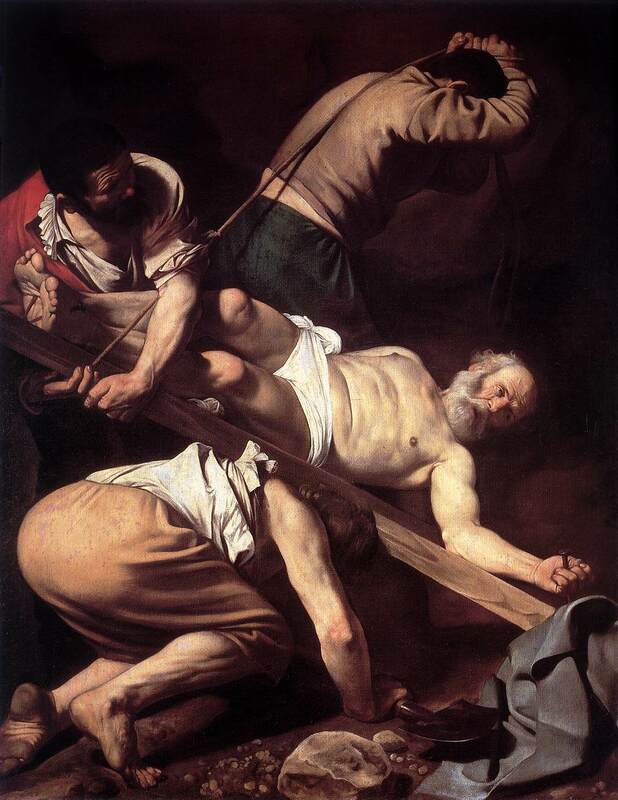 Caravaggio, "The Crucifixion of Saint Peter"
And so, I try to keep myself distant from where such life comes from—life that seems as foolish as it does odd. The strangeness of their stories helps keep me at arms length. It was such a different time and place that St. Martin of Tours gave his cloak to a beggar. A foreign place and the long ago past, certainly. But, more fundamental than this physical and temporal separation is the vast distance between such holy life and the disposition of my own heart and mind. I find that I struggle to grasp—both in the sense of understanding and in the sense of embracing—his courage and his motivation… and his faith. 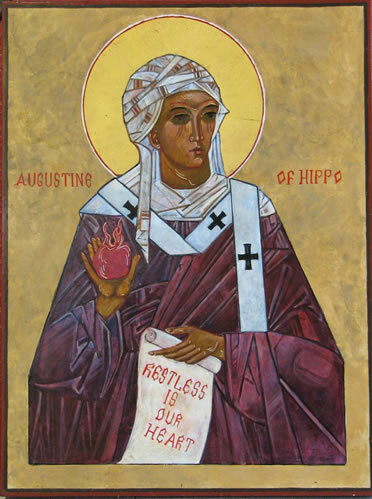 And the faith of St. Augustine, who gave up a promising career in the civil structure of the Roman empire. And the faith of St. Peter, who stepped out of a boat to get closer to his Teacher. And the conviction of St. Lucia—the name with which my wife and I baptized our daughter—who gave her life for the faith. From where do such people come? I was born in Cleveland. I played football in my yard with my dad and brother. I watched movies with my friends. I do not think that I am the saint type. They are somehow different. They are already other than my experience, my context, my self. They have to be, don’t they? How do I reconcile this overflowing of faith and love—an extravagant excess that cannot but strike my heart as something new, something other—with the intimacy of their humanity, and the quotidian and conventional presence the saints are in the life of the church? And if their closeness can, in fact, stand beside their strangeness then the truth of the matter is a profoundly unnerving one. Then the problem is the manner of my familiarity with them and not their close everydayness as such. I allow the saints’ lives into my own only on my terms, according to my own understanding of how things ought to be and according to my own small hopes and superficial desires. I have not opened myself to familiarity with them on their own terms—that is, according to the conditions of the singular Life they each seek to imitate. How do I allow something so different and so challenging to shape who I am? How do I truly let them into my heart? How do I truly let in God? To make allowances for, in the tradition of French philosopher Jean-Francois Lyotard, otherness as a breach inscribed on the heart of my identity? That is, after all, the only question that really matters: How do I come to believe in—and live with—a God who is, in St. Augustine’s terms, “more intimate to me than I am to myself”? And it is that question to which each saint responds through the contours of his or her own life. And it is in and through such life that God has worked and continues to work. For to be canonized—to be proclaimed a saint—is first and foremost an act of faith on the part of the church that this particular individual is now with God. James Martin, S.J., writes that our attention and attraction to a specific saint—our devotion—is a sign that that person has already taken an interest in our life. This saint, so his argument goes, has already begun to pray to God on my behalf. This is neither merely a pious tale nor idle speculation on his part, but opens to the heart of the Christian mystery. Faith enkindles faith. Love quickens love. “There is nothing that invites love more,” St. Augustine writes, “than to be loved first.” One of the early Christians, writing to a group of others, puts it this way: “See what love the Father has bestowed on us that we may be called the children of God…. We love because God first loved us.” I am lovingly drawn to their lives not only because they stand as an historical example of virtue, but because they are a language through which God calls to me here and now in this moment of my life. And standing before such a call—spoken through the lives of the saints—I find my excuses sound hollow. If God’s only speech in this world is vocalized in our response—in a response that is first a vulnerability to transformation—then sanctity begins with God and is carried out through my openness to love. Jerusalem or Assisi or Cleveland, the terms are the same. No longer exotic stories encased in marble and illuminated in stained glass, these lives are all particular lived manifestations of the response, “Here I am. Speak for your servant is listening.” No longer separated from me by their oddity, that only thing that marks them as different from me is the clarity with which the call is heard in their response. No longer sentinels of heaven high above me, these saints can meet my gaze. In this call, real closeness with the saints is possible. It means opening one’s heart—one’s self as a whole—to radical questions; it means allowing one’s heart to be illuminated by insights, however devastating they may be; it means giving one’s heart-felt consent to realizations that radically transform one’s life; but it means, first and therefore in a sense foremost, deciding to be vulnerable to this entire ordeal, and deciding, at every step of the way, to follow through with it, no matter where it leads. “To be sure,” St. Augustine notes (encouragingly so, I might add), “this renewal does not happen in one moment of conversion.” It demands a whole life. I am invited to wake each day and respond, “Here I am, Lord,” with as much attentiveness as I can muster. To open myself a bit more to the transformative love that calls to me and hold less tightly to the ease and comfort to which I so often cling. And then come tomorrow, from my new position of slightly increased faith, do it again. This, then, is from where the saints come. From a “Here I am, Lord” spoken with such love and fidelity that God’s voice is heard through, with, and in my own.